Hello and welcome to the 474th installment of the SWD. Islamic State’s improvised explosive device destroyed a Syrian Democratic Forces’ vehicle near Al-Nour mosque in the city of Raqqa. Two elements of the Syrian Democratic Forces were killed in the incident. 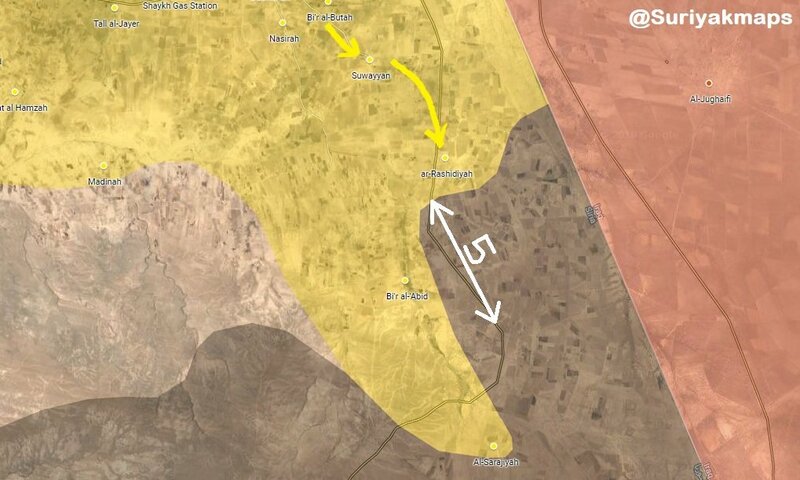 Syrian Democratic Forces captured the villages of Suwayyan and Al-Rashidiyah in southern Al-Hasakah from the Islamic State. Hayat Tahrir al-Sham continued security operations in the city of Sarmin, even though the locality was reported as cleared from the presence of the Islamic State’s cells on 30th of June. Hayat Tahrir al-Sham reportedly arrested the director of Sarmin hospital, Dr. Mahmoud Fatih Qaq, as he returned from Turkey to the locality. Besides arresting Qaq, Hayat Tahrir al-Sham also arrested 20 locals and asked internet providers / network owners in the locality to cut off access to the internet or face penalties. Unknown gunmen assassinated a commander of the Syrian Democratic Forces’ Deir al-Zour Military Council, Turki al-Khubail and another elements of the group in Al-Atal area on the road between Al-Shuhail and Al-Basira. Afghan National Security Forces killed five and wounded seven elements of the Islamic Emirate of Afghanistan (Taliban) in Ghormach district. Islamic Emirate of Afghanistan overran an Afghan National Army’s checkpoint in Gorzad area of Shirin Tagab district, reportedly< killing eight, wounding seven, and arresting two soldiers in the process. Islamic Emirate of Afghanistan seized three armored vehicles, two DShK heavy machine guns, four PK machine guns, and ten assault rifles from the checkpoint. Islamic Emirate of Afghanistan carried out a large-scale operation against the Afghan National Security Forces in Bala Hisar area of Faizabad district, reportedly overrunning three large areas in the aforementioned area. Five elements of the Afghan Local Police surrendered to the Islamic Emirate of Afghanistan during the operation, handing over three assault rifles and an RPG launcher to the group. Islamic Emirate of Afghanistan’s Al-Emarah News stated that a suicide attack targeted a United States Army’s convoy near a base in Kadr area of Pol-e Alam district. According to Al-Emarah News, the attack was conducted by Mullah Ubaidullah, who allegedly destroyed an armored vehicle and damaged another vehicle, as well as killing five and wounding several elements of the United States Army. Afghan National Security Forces killed 30 and wounded 13 elements of the Islamic Emirate of Afghanistan in Qarabagh, Ajristan, Andar, and Ghazni districts, according to the Afghan Ministry of Defense. Islamic Emirate of Afghanistan’s improvised explosive device destroyed an Afghan National Army’s armored vehicle and killed four soldiers in Sardar Kala area of Andar district. Afghan National Security Forces killed two elements of the Islamic Emirate of Afghanistan in Surobi district. Afghan National Security Forces killed three elements of the Islamic Emirate of Afghanistan in Pur Chaman district. Islamic Emirate of Afghanistan’s Al-Emarah News stated that the group conducted clearing operations against the Afghan National Security Forces in Pur Chaman district, overrunning Lower Rabat, Upper Rabat, Toli, Barzerery Killi, and Astawi areas of the aforementioned district. Afghan National Security Forces killed 13 and wounded ten elements of the Islamic Emirate of Afghanistan in Tarinkot district. Islamic Emirate of Afghanistan’s snipers killed three elements of the Afghan National Army in Soli and Khanqi areas of Tarinkot district. Afghan National Security Forces wounded two elements of the Islamic Emirate of Afghanistan in Shah Joy district. Afghan National Security Forces killed seven, wounded four, and arrested three elements of the Islamic Emirate of Afghanistan, as well as destroyed ten kilograms (22 pounds) of explosive materials, a vehicle, 36 improvised explosive devices, and several weapons depots and ammunition caches in Garmsir, Nawa-I-Barakzayi, and Sangin districts. Islamic Emirate of Afghanistan attacked an Afghan National Army’s foot patrol in Yakchal area of Nahri Saraj district, killing and wounding three soldiers.